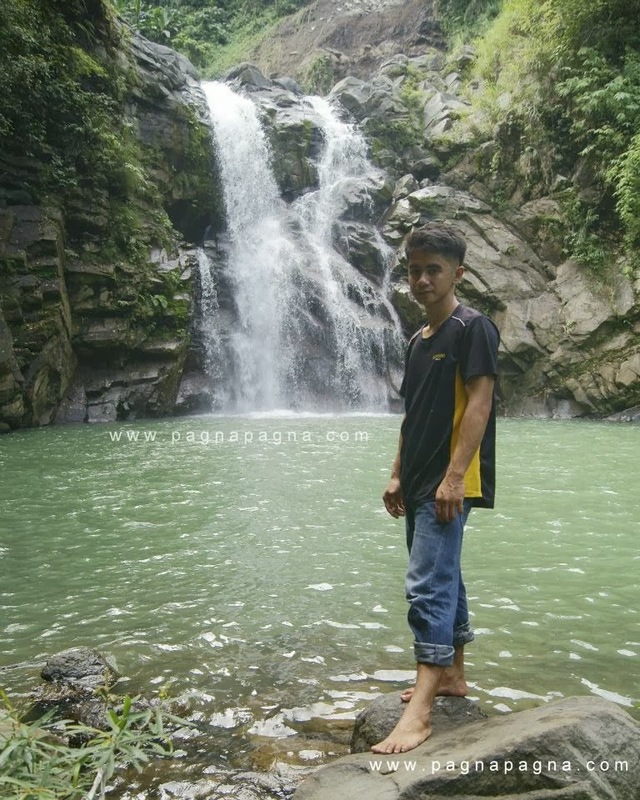 "Located between the Municipalities of Sablan, Benguet and Burgos, La Union, this waterfall is in the same tributary with that of Towing Falls"
I got a tricycle ride at Burgos (La Union) Public Market. 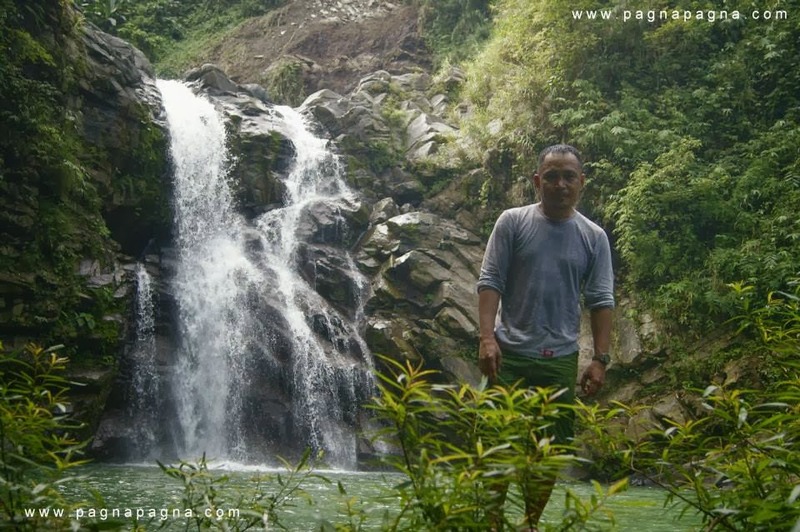 The driver introduced himself as "June" who hailed from the waterfalls area before, but now he is residing at a house closer to the town center area. On a tricycle, we departed from the Public market at 8:59 am through an uphill cemented one-lane road. The road terminated into an earth road and we went down from the tricycle (because the road is now muddy) at 9:09 am. He parked the tricycle and we walked through foot paths and trails going down the mountainside. The earth road and trail was a little bit muddy as it rained a little yesterday. We arrived at the riverside at 9:29 am. My companion "June" the tricycle driver, who was also my impromptu guide, took off his slippers and left it on top of one of the rocks. I also removed my rubber shoes and set it aside as we will be crossing the shallow river. 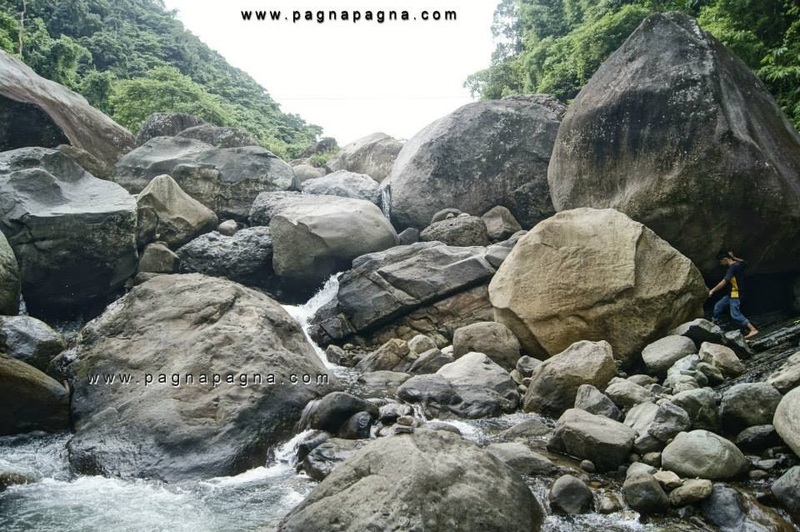 As the river and riverbanks were filled with big rocks that we can not even see the ground beneath it, we literally hopped from one rock to another, barefooted. 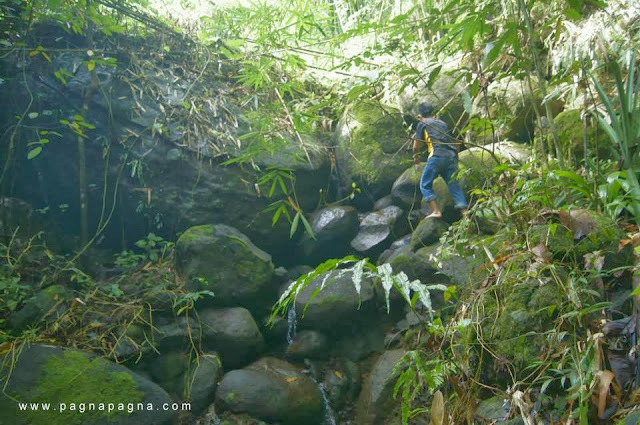 After some minutes of hopping from one rock to another, we arrived at the first cascade and went down to its pool area. The upper cascade. "June" told me that it is here where they usually swim when they were kids. We walked just few meters and found ourselves at the tip of the drop-off of the main cascade and there we took a rest (9:50 am). I told my companion that we should go down, so we can see the waterfalls in its entirety. He went looking for a path at the southern side of the falls and came back with positive result. At the side of the mountain, south of the waterfalls, still barefooted, we climbed the slope teaming with some grass and shrubs. 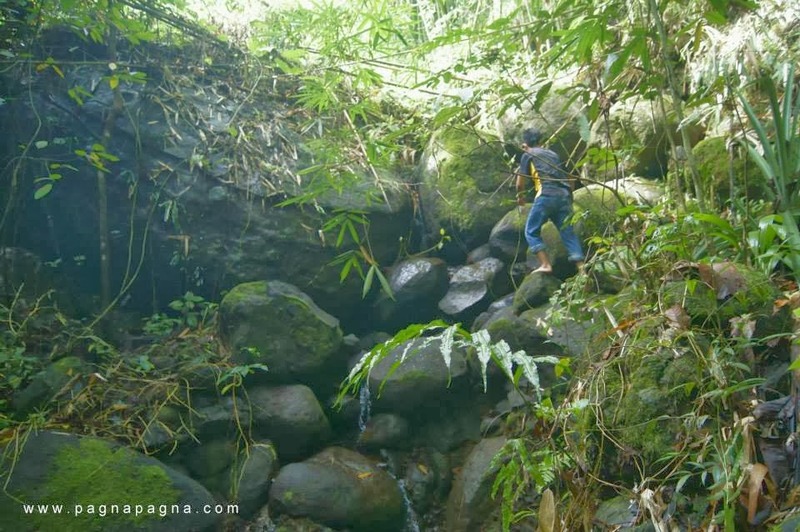 We walked through bamboo areas until we came across a small stream that we followed going down the mountainside back into the river below. From the riverbank, we now can see the waterfalls from a distance upstream. We passed by the lower cascade and went on top of it to where the pool area of the main cascade is located. We rested for a while and took some photos and videos of the waterfalls. 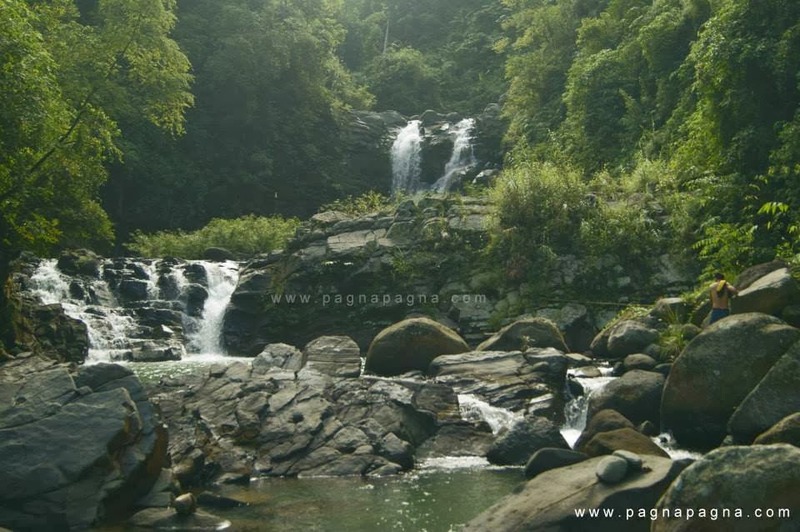 The lower cascade and the main cascade of Budahaw falls as seen from a distance. We went back on the same mountainside trail going to the top of the main cascade where we rested again (11:07 am). There we had a snack and drunk my bottled water. After few minutes, we continued walking. Passed by the upper cascade and then we hopped from one rock to another until we reached the mountainside trail at 11:45 am. Oh!, we also went back for his slippers and my shoes which we placed on top of the rocks somewhere near the river. We walked along the mountainside trail. Only that time, it was all uphill hike. Humidity was high. I felt so tired just doing few strides uphill. I can not cope-up with my companion's phase. I could use some help, so i let him carry my backpack with all the tripod and everything, Yeah! that's the way to do it. It made the assault easier but i still trailed behind (I need more exercise). We finally arrived at his parked tricycle on the roadside at 12:09 pm. Through his tricycle, we arrived at the Burgos Public Market at 12:25 pm. From there, I went to the roadside (Naguilian road) where i rode a bus going back to Home Sweet Home. The Budahaw Falls is located between the municipalities of Sablan and Burgos. Sablan being in the province of Benguet and Burgos in the province of La Union. It can be reached from Sablan through Barangay Pappa by a hardy hiker but it is more accessible from the town of Burgos, La Union. The waterfalls is made up of 3 layers, each with its own pool area. The one above has the smallest drop while the second one is the main cascade and regarded as the Budahaw Falls. From Manila take a bus bound for either of these : Laoag City, Vigan City, Candon City, Bangued (Abra), or La Union. But you have to get down at the Plaza of Bauang, La Union.Then walk your way to the waiting shed located at the road going east (Naguilian Road) fronting the Municipal Library of Bauang. From there, wait and ride a bus bound for Baguio City. Get down at barangay New Poblacion of Burgos, La Union (it is near the Public Market and a walk away from the Municipal Hall of Burgos). 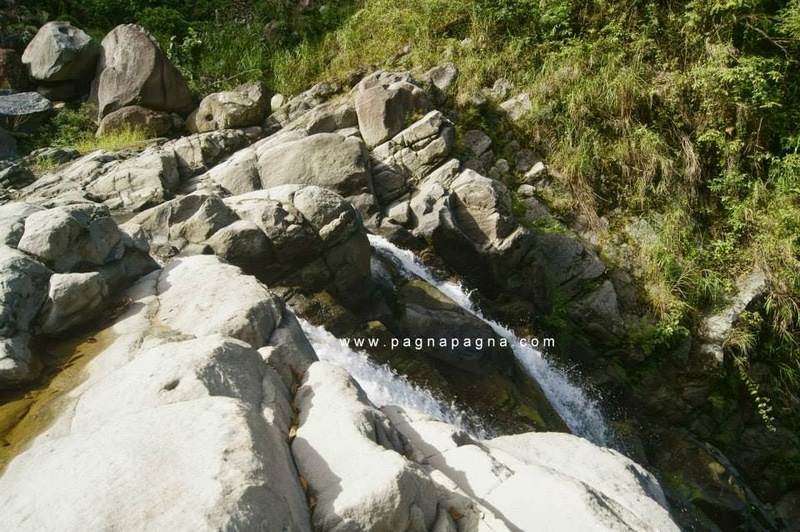 Walk up to the Market and ride a tricycle going to Sitio Sulbuan (or Suyboan) of Barangay Bilis and tell the driver you are going to Budahaw Falls (you may ask for an impromptu guide). You may also go directly to San Fernando City, La Union and ride a bus (Partas bus) bound for Baguio but get down at Burgos, La Union town proper. 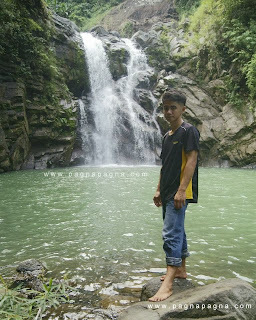 Walk up to the Market and ride a tricycle going to Sitio Sulbuan (or Suyboan) of Barangay Bilis and tell the driver you are going to Budahaw Falls (you may ask for an impromptu guide). From Baguio City ride a mini-bus bound for San Fernando City or Abra or Partas Bus bound for Laoag City but you have to get down at Burgos, La Union town proper. Walk up to the Market and ride a tricycle going to Sitio Sulbuan (or Suyboan) of Barangay Bilis and tell the driver you are going to Budahaw Falls (you may ask for an impromptu guide). 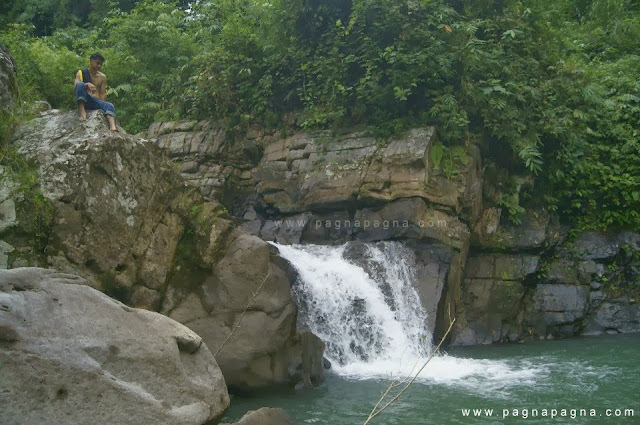 It's a great place for an adventure package: bouldering, river trekking and hiking - hope I can join you someday in La Union!